Could Lionel Messi’s record be held by Godfrey ‘Ucar’ Chitalu? The world recently saluted Argentinian footballing genius, Lionel Messi, when he surpassed Gerd Muller’s record of 85 goals in one calendar year, but he still has a way to go if he is to beat Zambia’s Godfrey Chitalu, who scored 107, ironically in the same year of Muller’s tally. The Siya crew were informed of Chitalu’s exploits and decided to look into the career of the former Kabwe Warriors hitman. 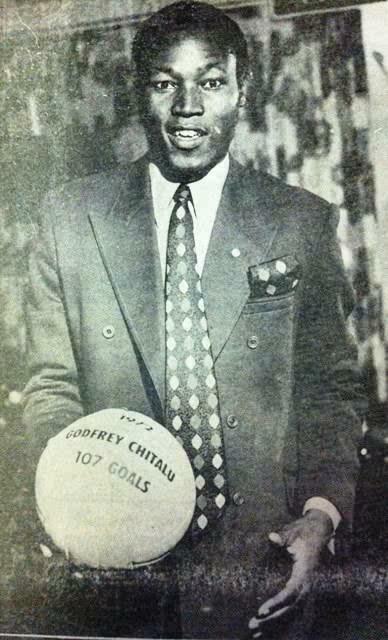 Chitalu, a five-time Zambian footballer of the year, began his fine form in 1968 when he reportedly scored 81 goals for Kitwe United, four years later he dwarfed Muller’s 85 goal tally by hitting the back of the net 107 times in all competitions, though his record was never recognised by football’s governing body, FIFA. The crew spoke to the Football Association of Zambia who explained that they are currently trawling through their archives in order to get the late striker the credit that they feel he deserves. Chitalu, who was given an ‘Achievement Recognition Award’ by FIFA following his retirement in 1982, went on to become the head coach of his country, but tragically died in the 1993 plane crash that wiped out Chipolopolo’s golden generation of stars.